For some time now I’ve been trying to come up with an idea for a quiz. A quiz that no-one else has thought of. A quiz that will be entertaining, easy to grasp and challenging at the same time. A quiz that, once it’s initially successful, will not fade in the public’s affections and will run for years and years. A quiz, basically, that does everything the ‘Just a Minute Quiz’ on Larry Gogan‘s radio show does. I’ll be turning 33 this month and, as far back as I can remember, there’s never been a time when the JAMQ did not exist. It is, by accident or design, a perfect nugget of quiz – quizzing distilled, if you will. The 60 second time limit puts pressure on the contestants, prevents cheating and ensures that the round is over before the listener’s attention wanes. 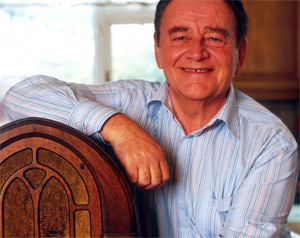 It was quite a thrill this week when, in honour of this blog’s 100th post, Larry Gogan himself spoke to me about the JAMQ.